Posted on Sat, Mar 24, 2012 : 11:09 a.m.
GREEN BAY, Wisc. -- The Michigan hockey team's record-extending 22nd consecutive NCAA tournament appearance was a quick one. The Wolverines fell, 3-2, to Cornell in a first-round game Friday night at the Resch Center. Every year of the streak has been unique, from national championships in 1996 and 1998 to an unlikely run to the regional final in 2009, when it looked like the streak would end. Former Michigan players were asked to share their most memorable moments from each year of the streak. For fifth-year goaltender Shawn Hunwick, Friday's loss was minutes old. For others, losses still burn as if they were minutes old while others couldn't remember who they were playing. Michigan made the first tournament appearance of coach Red Berenson’s career in his seventh year at the helm and the first for the program since 1977. Michigan defeated Cornell in 2-1 in a best-of-three series in the first round before bowing out in the quarterfinals to Boston University. “The series (at Yost Ice Arena vs. Cornell) was big. I think it was a big turning point, the first time in the NCAAs for Michigan in a quite a while. Then going out to Boston and not doing well, that sort of left a sour taste in my mouth to kind of understand that that’s where we wanted to be and how hard we had to work to get back there." Michigan was in back-to-back tournaments for the first time since the 1956-1957 seasons and advanced to the Frozen Four for the first time since finishing as runner-up in 1977. The Wolverines lost to Wisconsin in the semifinal round. 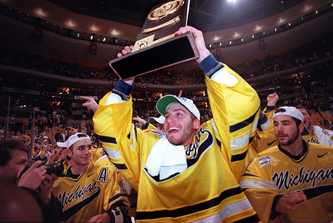 Michigan made it to its second consecutive Frozen Four, the first time that had happened since 1956-57. The Wolverines lost to eventual national champion Maine, 3-2 in overtime in a semifinal. Maine was led by freshman Hobey Baker winner Paul Kariya, who would go on to star in the NHL for 15 years. 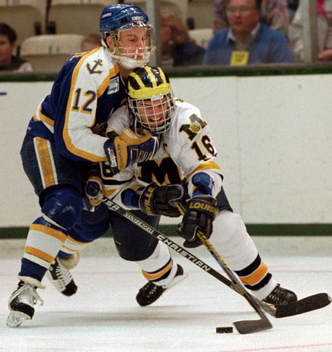 Michigan's Brian Wiseman is held by Lake Superior State's Sean Tallaire during the 2004 NCAA West Regional final at Munn Ice Arena in East Lansing. LSSU won, 5-4, in overtime. Michigan was the top seed in its regional, which at the time meant a first-round bye. The Wolverines lost 5-4 in overtime in the regional final to eventual national champion Lake Superior State, a team they had beat all four times they met during the regular season. Michigan made it back to the Frozen Four, the first of four straight appearances, and lost to Maine, 4-3 in triple overtime of a semifinal. Maine would lose to Boston University in the final. Michigan made it to the Frozen Four for the fourth time in five years and finally came away with the grand prize, defeating Colorado College, 3-2, in overtime to claim the school's first national championship since 1964. “I remember us going up to Lake (Superior) State (during the regular season) and us getting swept by them and it wasn’t a very pleasant ride home. It was kind of basically the turnaround of our season." The top-ranked team in the country for most of the year, Michigan made it back to the Frozen Four, but its bid for the school's first back-to-back national championship since 1955-56 ended with a 3-2 semifinal loss to Boston University. Bill Muckalt and goaltender Marty Turco look on as Chris Fox holds up the 1998 national championship trophy after a win against Boston College at the FleetCenter in Boston. Michigan came back from a three-goal deficit in an opening-round win over Denver, scoring five unanswered in a 5-3 win. The Wolverines’ Frozen Four streak was snapped the next night in a 2-1 overtime loss to New Hampshire in the regional final. New Hampshire was led by future Red Wings goaltender Ty Conklin. now a volunteer goaltending coach for Michigan. Michigan won its opening round game, but was denied a Frozen Four berth with a 4-3 overtime loss to defending national champion Maine in the regional final. Michigan made it back to the Frozen Four after beating St. Cloud State in its regional final. The Wolverines would lose in the semifinals to eventual national champion Boston College. Minnesota's Grant Potulny fires a shot past Michigan goalie Josh Blackburn at the 2002 NCAA Frozen Four in St. Paul, Minn.
Another back-to-back Frozen Four appearance and eighth trip in 11 years. Michigan lost 3-2 to eventual national champion Minnesota in the semifinals. Michigan advanced to its third straight Frozen Four and fell 3-2 in overtime in the semifinal round to eventual champion Minnesota, which beat New Hampshire 5-1 in the championship game. but that second game, it doesn’t get any better. The building was rocking and, I mean, it was neck and neck (against Colorado College, Michigan won 5-3). ... We ended up having a little heartbreak there, we lost in the semifinals in overtime to Minnesota, who ended up winning the whole thing, but that first year was unbelievable." -- Al Montoya, then a freshman starting goaltender, now plays for New York Islanders. 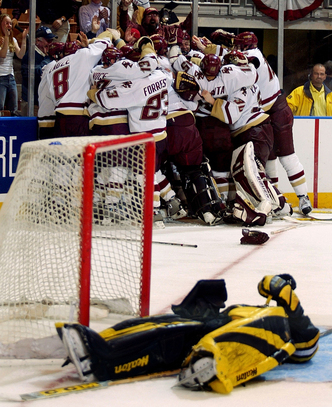 Michigan goalie Al Montoya lies on the ice in dejection while Boston College players celebrate their 3-2 overtime win at the 2004 Northeast Regional title game. Michigan fell one game short of its fourth consecutive Frozen Four, losing to Boston College 3-2 in overtime of the Northeast Regional. Up 3-0 on Colorado College in the second period of the Midwest Regional final in Grand Rapids, the Wolverines would eventually fall, 4-3. “I felt like I could have done more in that game (against Colorado College), but at the same time it was exciting. Every year we had a chance. Every year we felt like we could win it, it just comes down to one game, one last chance, and I don’t know it just wasn’t right for us." For the first time in its tournament streak, Michigan did not win a game in tournament play. The Wolverines lost 5-1 to North Dakota in Grand Forks. "It was a tough matchup. It was fun to play in their building, beautiful arena, but they had a good team and I think they beat us pretty good that year." -- Matt Hunwick, then a junior defenseman, now plays for the Colorado Avalanche. Michigan once again had a first-round matchup with North Dakota and once again fell to the Fighting Sioux, this time 8-5 at the Pepsi Center in Denver. The loss made that year's seniors the first class since 1990 not to go to a single Frozen Four. "We actually got to play here in Denver, great experience. I think we played really well, actually, you know just couldn't keep the puck out of the net. It's one of those things it's tough to go out your senior year losing in the first round. ... We always expected to get there. Just getting there wasn't good enough I don't think for any person on the team." Top-ranked Michigan defeated Clarkson 2-0 in a regional final to advance to the Frozen Four, where it would lose to Notre Dame. The Wolverines had to withstand a 6-on-3 attack in the final minutes of the regional final after then-freshman Carl Hagelin and sophomore defenseman Steve Kampfer were called for penalties just 55 seconds apart and Clarkson pulled its goalie. “I'd say the quarterfinals (stick out the most). I think we won 2-0 or 2-1, I remember our goalie (Billy Sauer) had like a five-save sequence in the last 10 seconds. He saved five shots, good ones, all on his back in the third. And I just remember how everyone -- it was almost like we won the whole thing -- we all just piled on top of him." -- Carl Hagelin, then a freshman forward, now a rookie for the New York Rangers. Coming off of a strong regular season, the third-ranked and top-seeded Wolverines lost their opening-round game to Air Force, 2-0. It was the first time in 71 NCAA tournament games that the Wolverines were shut out, and they haven't been since. -- Greg Pateryn, then a freshman defender, now a senior and alternate captain. It looked like the streak was over. Michigan finished in seventh place in the CCHA, and needed to win the conference tournament to secure an NCAA bid. And it needed to do so with a guy in net no one had ever heard of, Shawn Hunwick. A 5-foot-7 former walk-on who had one career start under his belt entering the postseason, Hunwick was in net as Michigan won six straight to win the CCHA tournament and earn the conference's automatic bid. Michigan would fall one game short of a Frozen Four berth, losing a 3-2, double-overtime game against Miami. -- Chris Brown then a freshman forward, now a junior. Michigan defeated top-seeded North Dakota 2-0 in the first game of the Frozen Four and advanced to the championship game, where it fell to Minnesota-Duluth 3-2 in overtime. Nothing came easy for the Wolverines with three of its four tournament games decided by one goal and two going into overtime. -- Jon Merrill then a freshman defenseman, now a sophomore. The top seed in the Midwest Regional and No. 2 overall in the NCAA tournament, the Wolverines bowed out in the first round for just the fourth time in the 22-year streak. "You never want to give up a goal to end the season, to end your career, and it’s happened the past three seasons with overtime, so it’s disheartening that we couldn’t get this win. But I think the rest of my life I’ll look back at my experience at Michigan and be very proud." -- Shawn Hunwick, senior goaltender. -- Pat Leonard of the New York Daily News contributed to this story. Sun, Mar 25, 2012 : 11:23 a.m.
As great of teams Michigan has had, I think they've underachieved under Red Berenson the past 10 years. With all of the draft picks we've had, it's amazing it's been 14 years since a National Championship. The hockey gods seem to be against us, especially in the last three seasons. Sat, Mar 24, 2012 : 3:48 p.m.
And thanks for the recap of the past 20 tournament teams. A little early after this loss to appreciate it fully, but I remember most of them and those games now that you've mentioned them. The 98, and last, national championship team just shows how an underdog can really roll in this tournament, especially with a great goalie. Sat, Mar 24, 2012 : 3:45 p.m. Disappointing loss, especially with a potential game winner being disallowed early in the game. Lots of ups and downs and changes of momentum in college hockey. Had a couple of good scoring chances in OT, but Big Red got the fortunate rebound right to their stick. I thought this team should get to the FF with a decent chance to win. Another 3-2 OT game for M, won some, lost some.